I have finally succeeded in having a cat flap installed in my bedroom door... this has taken much more time and effort than I anticipated because the door is double-glazed and I really didn't want to have a half PVC door put in. It would have been much easier from the cat flap point of view, but I would have lost an incredible amount of natural light. Anyway, the cats appear rather unsure what to make of it all. Furretti was actually the first to venture out, but she decided that it wasn't that interesting, and promptly returned to her current favourite spot on top of my school papers for another nap. Furretti's favourite spot is nearly always on top of whatever I'm working on, preferably while I am working on it. Miaowrini is much more fascinated by the idea of "the great outdoors". Because the cat flap is much bigger and noisier than the previous one (due to the double glazing) I have temporarily taken the door off to encourage exploration. 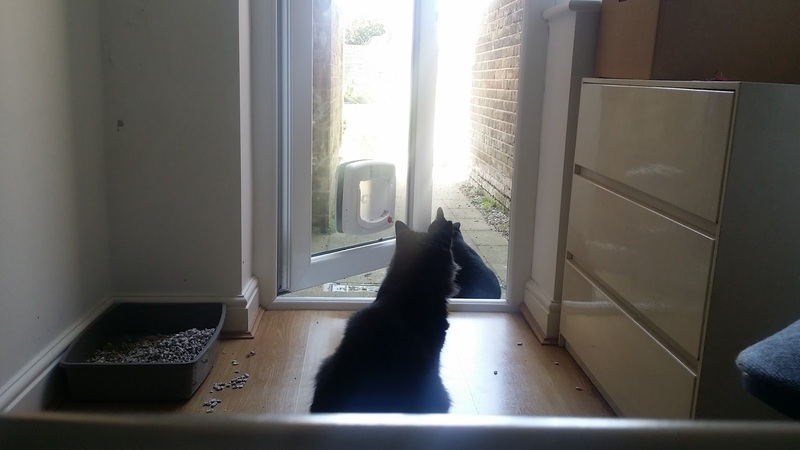 Miaowrini has been going out for periods of 20 seconds or so, and then sits staring at the door. If I return to the sitting room, she immediately runs after me - as if she is only brave enough to venture out if I'm beside her. So it is probably just as well that I had to wait until the holidays before getting the cat flap. I expect that the two kitties will soon get the hang of going outdoors again, and then it will be business as usual. In anticipation, I have started up a new version of the Kitty Kill Count... anyone want to start a book on how soon I get presented with my first seagull...? *Yes, I know it should just be "cattus" not "kitti cattus", but I couldn't resist!